I remember it vividly. it was 9:47 in the morning on June 27, 2002. That moment was perfectly still like a calm before a storm. What followed was a devotional frenzy that all good Tamil Nadu temple-goers know only too well. Three hundred thousand devotees were packed around a 217-foot rajagopuram (one of four main outer temple towers) at the Arunachaleswarar temple in Tiruvannamalai, South India. They had been there all morning some since the night before. Suddenly, as if in response to some orchestrated cue, everyone roared, "Annamalaikku Haro Hara," "Glory to the Lord of Annamalai." Six eagles circled over the temple's sanctum sanctorum and abhishekams (water ceremonies) were simultaneously performed in nine towers and nine shrines throughout the temple complex. The 1,300-year-old temple was experiencing its fifth known Maha Kumbhabhishekam. It was history in the making. The last such ceremony occurred in 1976. The two before that were in 1944 and 1903. A Maha Kumbhabhishekam is held either to formally consecrate a new temple or reconsecrate an old one, which usually occurs at twelve-year intervals, following renovation, extensive cleaning and renewal. The rites culminate with the priests' pouring sanctified water over the temple spires, each of which resembles an inverted pot, or kumbha. Leading up to the consecration, a number of rituals are performed by the sthapati (main temple architect) in charge of the construction or renovation. The temple at Arunachaleswarar is the second largest in India. Throughout its long history, it has enjoyed extraordinary popularity among wealthy patrons. This remains true today. Just before the Maha Kumbhabhishekam of 2002, more than a million dollars was spent on temple renovation and repair. Although a great deal of this money came from affluent donors, much was also solicited through pamphlets, posters and "door stickers" as well as on television. All nine gopurams were repaired, renovated and repainted. The 1000 pillared mandapam (main temple hall) was completely cleaned and even outfitted with electricity. The temple's entire collection of ceremonial utensils were scrubbed and polished. And much of the old ornamentation was refurbished with new, intricately designed carvings and designs all gold-plated. During the ceremony itself, more than five thousand policemen were on hand to keep order. The water and fire rituals commenced in coordination with the conclusion of a nine-day annual festival featuring worship of the Hindu Goddesses Durga, Amman and Pitari. The inaugural puja was held in the newly constructed yagasala (a place of fire worship) on the evening of June 22. During the next six days, grand homas (fire ceremonies) were conducted at 102 agni kundams (fire pits) built in the yagasala just for this purpose. Each of these homas was dedicated to a God or Goddess. Thirty-three were for Annamalai (a form of Lord Siva), 25 for Amman (a form of Goddess Shakti), and five each for Gods Vinayagar, Murugan, Somaskander and Venugopal. The remaining 24 were committed to the parivara devathas (canonized saints devoted to Lord Siva). Three hundred Sivacharyas, 15 oduvars (traditional temple singers) and 120 Vedic scholars from all over India orchestrated the homas while 108 tavil players (temple drummers) and nadaswaram masters (temple horn players) provided appropriate festival music. The grand procession around the temple was led by Tyagaraja Gurukkal (69) and Alasyanatha Gurukkal (54), both long-time chief priests at Arunachaleswara Temple. Doordarshan, Jaya TV and a local television channel beamed the Kumbhabhishekam live as it occurred. All India Radio also broadcast a running commentary. Dina Malar, a renowned Tamil daily, hired seven photographers to cover the event. All in all it was a grand event in Tamil Nadu, a gracious gift of upliftment to its motherland of India, otherwise deeply troubled by the darker events of 2002. 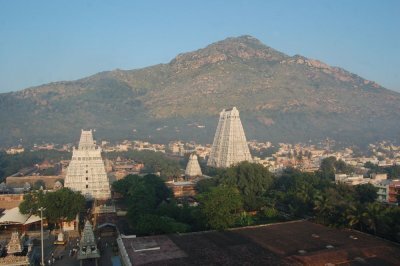 For hundreds of years, the town of Tiruvannamalai and the temple Arunachaleswara have stood foremost among South India's most sought-after spiritual destinations. Successive South Indian kings always gave great importance to them both. They dug ponds and wells; built gopurams, compound walls and prakarams (temple courtyards) and donated jewels and gold. Famous Indian kings down through history; like Rajaraja Chola, Rajendra Chola, Harihara Bukkar, Krishna Deva Rayar, as well as the kings of the Chera, Pallava, Pandya, Rashtrakotta, Hoysala and Naik dynasties, were proud to have Tiruvannamalai as part of their kingdom. Some of them even made it their capital. Even when caught in political crisis, they held onto Tiruvannamalai. Historical details about the Arunachaleswarar Temple are revealed in stone inscriptions on the prakara walls and copper plates of the temple itself. These inscriptions, which refer to a period of time spanning a thousand years starting from 750AD, indicate that the greatness of Arunachaleswarar was made known to the kings of the times primarily through important South Indian devotional literature like the Thevaram and Thiruvasagam. Aruna literally means “force” and achala means “that which cannot be moved.” So, Arunachaleswarar Temple represents Lord Siva as indomitable power. The Arunachaleswarar Siva Temple is located 125 miles from Chennai, the capital of Tamil Nadu. Its day-to-day administration is currently controlled by the Hindu Religious and Charitable Endowments department of the Tamil Nadu Government. Tiruvannamalai and its famous temple are attracting an increasing number of pilgrims every year. On a single festival day, it may accommodate as many as a million devotees. And that was before the million-dollar renovation and Maha Kumbhabhishekam of 2002. Certainly, the best is yet to come.